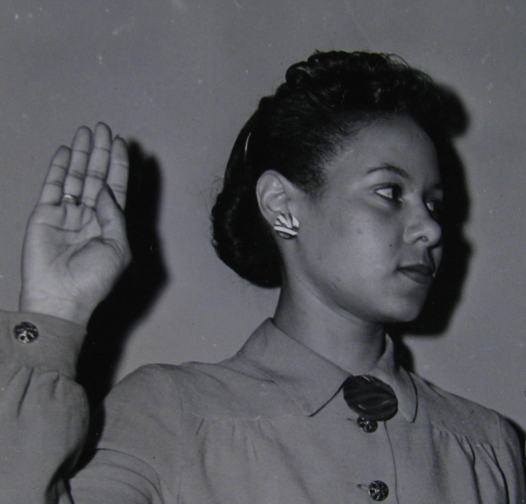 Frances was one of two African American female officers in the Navy during World War II. She grew up in Philadelphia, but eventually moved to Spanish Harlem in New York City with her mother. In her memoirs, she recalled getting little or no guidance about college. When I learned that without high Regents grades in both geometry and algebra, I would have no chance at all of beings considered for college, I was devastated. I do not recall feeling, at the time, that I had been overlooked by the school system. Later, when I realized that there were people called guidance counselors in all the schools and that there must have been one or two in George Washington (high school), especially since it was among the more highly rated schools, I was angry. Whoever had the job had not cared at all that I was there. It must have been true — what people in the African American community always said — that no effort was made to ‘guide’ us because it was assumed that we would go to trade school or get a job — any job — on leaving high school. It had never occurred to me that I would not go to college. I wanted to be a journalist and heard that the University of Pennsylvania had an excellent school of journalism. She ended up taking remedial courses and qualified to attend Hunter College in Manhattan. This photograph of Frances Wills being sworn into the Navy comes from the National Archives. I’ve long had copies of the Harriet Pickens and Frances Wills officer training graduation photos, and have been inspired by them. I decided today to see if I could find out what happened to these pioneers, and your series on Frances Wills Thorpe has been a great help. I’m really glad to see her honored. Thanks! My late godfather published the memoires of his wife Francis Wills Thorpe under the titile , ‘Navy Blue and Other Colors’. My Aunt Fran passed away in 1997 and he in 2011. He always felt it was important that her story be told. Thank you for that information! I had no idea her memoir was in the Library of Congress. I have several copies of the book myself. I just knew her as ‘Aunt Fran’. She sewed and made dresses for me, served tea from fine china and experimented with recipes (she once made a birthday carrot cake for me that had Campbell’s tomato soup in it, lol!). She and my godfather loved cats and they always had two (not kid friendly). This whole ‘other’ life she had still has me amazed! Do you know where I could buy her memoir? On Amazon, it’s nearly $200 . . . If you have a chance to get to DC you can read the draft at the Library of Congress. $200! Are you serious??? I have to look that up. Wow. Both she and my godfather, her husband are deceased. I have no idea who is managing sales now.